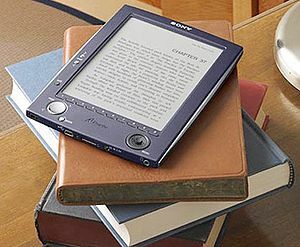 With the new trend in E-Books and readers there is many sites out there offering both free and purchasable EBooks. From amazon to MobiPocket and software from both of them to enable both your pc and your mobile devices to read e-books it seems the way of paper and ink are becoming like the way of cds and dvds. The possibilities are grand for the new digital trend especially in the education sector. Just imagine the collage student can carry all of his or her books in one SD card or on her laptop. This could also lower the cost of books for both the university/collage and the k-12 schools. Though I have a feeling the publishing companies will either try and squash the possibilities of E-books for schools or make the cost of them the same to make it less advantageous to go digital. Either way I believe E-books will eventually be the norm both in ones house and in the schools across America. Below are a few links that might be helpful to those interested in E-books.